In 1961, Russia rocked the world when their cosmonaut Yuri Gagarin became the first human to go into the outer space and successfully went around the Earth’s orbit once. It only took two years for Russia to again make another historical moment by sending Valentina Tereshkova to the Earth’s orbit and making her the first woman to travel into the space. By that time the Space Race between Russia and America was still going tight, but the latter had only launched their first woman cosmonaut Sally Ride in 1983. The world may recognize Gagarin better than Tereshkova, despite her equal sucess, that is why now we will talk about her and go deeper to get to know more about her and 13 unknown facts of Valentina Tereshkova , the first woman in space. It was a shame that during the era women hadn’t gotten enough and equal appreciation as men. Tereshkova was born in Bolshoye, a village in Oblast, located in central Russia on March 6, 1937 and is still alive and well now at the age of 82. Her parents were originally from Belarus who moved to Russia before she was born. At that time, her parents belong to the worker class who earned wages. But then her father, Vladimir Tereshkov, became a tank leader and died as a Russian War Hero during the World War II. A monument is now erected on the site where he was killed; in Lemetti – an area that borders Russia and Finland. Tereshkova was only two years old when her father died in the war. Tereshkova’s journey in education was obviously not a luxurious one by looking at her family background. She only started going to school when she was eight years old, in 1945, and quit at the age of 16 and pursue the education through correspondence courses. Something that genuinely interested her since a young age was parachuting. This, then, made her join an Aeroclub where she got a proper skydiving training. Her first jump was done on May 21, 1959 when she was 22 years old. At the same time, she was also a worker at a textile factory like her mother. Two years after the jump, she started to get involved in politics, specifically as a secretary for a Communist League. A year after Russia sent Yuri Gagarin to the Earth’s orbit, the chief Soviet rocket engineer – Sergey Korolyov – had a vision to send a woman cosmonaut for the same mission to complete Russia’s glory in the field of rocket science. Valentina Tereshkova was one among five chosen women for this mission after 400 applicants were tightly selected. She was a strong candidate because of her expertise in skydiving, family background, age, and physical fitness. After several months of intensive training included 120 parachute jumps and pilot training, two best candidates were planned to be launched into the space in two different spacecrafts consecutively. But the plan was changed in March 1963 and only one woman cosmonaut was going to be launched. 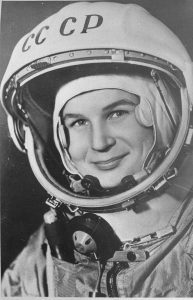 Tereshkova was the chosen one with a teammate of hers as a backup and she was going to ride in Vostok 6 after Vostok 5 – manned by a male cosmonaut – flew. On June 16, 1963 – at the age of 26 – Valentina Tereshkova successfully got launched into the space and went around the Earth’s orbit for 48 times. The whole mission took her 2 days, 22 hours and 50 minutes. She said the flight caused her nausea and body discomfort but didn’t stop her from completing the mission and going back safely to the Earth. Her code name during the flight was Chaika, means Seagull, that then handed down to an asteroid as its name. Five months after the mission, Tereshkova got married to a Andriyan Nikolayev – who was also a cosmonaut – at the Moscow Wedding Palace. She gave birth to a daughter, Elena Andrianovna Nikolaeva-Tereshkova, the following year. Elena was the first person whose parents were both cosmonauts. Sadly, though, the marriage had to end in 1982. Tereshkova got married again after that and her second husband died in 1999. In 2013, she was offered a one-way ticket to Mars if the possibility would ever happen. The extraordinary flight had given Tereshkova a lot of opportunities including pursuing her education in the engineering until she got graduated in 1977 and earned doctorate. She represented Soviet Union in many international occassions while at the same time getting chances to speak for women – which was a very big and important role at that time – and promoting peace for the world. When she retired from the Russian Air Force in 1997, she was a major general. Tereshkova also one among several people who are still alive and have their names handed down to a lunar crater; her’s lies on the far side of the Moon. The story of her life is written in two books; It Is I, Sea Gull; Valentina Tereshkova, the first woman in space published in 1975 and Into That Silent Sea published in 2007. Her name also inspired many people and appeared in many films, songs, and writings. Valentina Tereshkova was definitely a legendary woman in the history of human race. She was also very blessed to be able to become the first woman to go into space, because it took 19 years after her flight with Vostok 6 for another female Russian cosmonaut to fly to the outer space. Her group of female cosmonauts also didn’t last really long because it was dismissed in 1969. Those were 13 unknown facts of Valentina Tereshkova you need to know. Through her story we learned not only about a great human being but also a woman specifically. She is definitely among the amazing women who give females the voice they deserve.